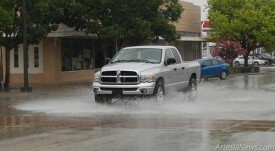 Below, a truck drives through a puddle at the intersection of Second and Main streets this morning as Artesians awoke to rainy, overcast skies. Above, David Garrett, water operator, and Kelvin Stokes, water tech, with the City of Artesia shake off the dampness to locate cracks in asphalt around town. The NMSU Ag Science Center reported .26 inches of precipitation Monday with .19 recorded so far today. Temperatures also took a dive, with Monday’s high 74 and today’s forecast for 69.